We are delighted to announce the appointment of Mr Seth Bolderow as the new Headmaster at Wetherby Senior School following a thorough recruitment process involving a strong field of candidates. Mr Bolderow will join the school in September 2017 from his current role as Deputy Head of Harrow International School in Hong Kong, where he has been in post since 2012. Mr Bolderow was educated at Norwich School, read Classics as an undergraduate at Exeter University and went on to gain a MSt, also in Classics, from St. Anne’s College, Oxford. He gained QTS through the Graduate Teacher Programme during his first teaching post at Blundell’s School. 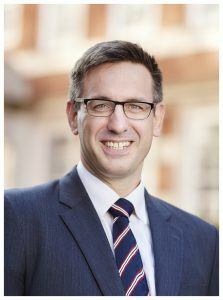 Since then, he has gained a variety of experience in both boarding and day schools in the UK, holding both academic and pastoral leadership roles. Before moving to Hong Kong, he oversaw the development of the new Sixth Form Centre at the John Lyon School and is, therefore, well-placed to lead Wetherby Senior as it prepares to open its Sixth Form in 2018. “Mr Seth Bolderow is extremely well-suited for the Headship at Wetherby Senior and we are all delighted to be making this appointment.